When you get on a plane, the last thing you want to think about is what you’ll have to do to survive an emergency crash landing in the water. But knowing exactly how to safely evacuate a plane could one day save your life, so researches created a terrifying Oculus Rift emergency landing simulation that looks far more effective than a safety pamphlet ever could be. The demo seems like it takes a ‘scared straight’ approach to teaching airline passengers the proper procedures for evacuating a downed aircraft, but in reality the researchers at Italy’s University of Udine’s HCI Lab found that flyers were better able to recall those procedures a week later after having the first-person VR experience instead of just studying a pamphlet. And strapping an Oculus Rift unit to someone’s head and allowing them to experience a 10-minute demo is a lot cheaper than trying to recreate a plane that’s made an emergency landing in real life. It’s probably not the greatest idea to have airline passengers go through this demo while waiting for takeoff, or even while they’re waiting in the lounge for boarding. 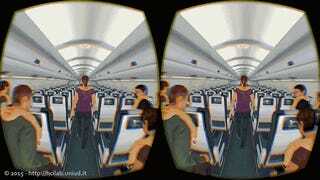 But since it’s available for download on the Oculus site, travelers with upcoming flights could certainly try the simulation in the comfort of their homes well ahead of their departure, while still being confident they’ll know exactly what to do in the event of a real-life emergency.